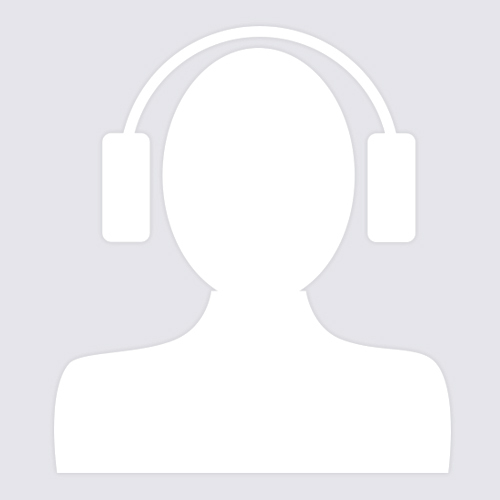 I have an acoustic guitar connected to a Focusrite 2i2 that I usually record into Garageband on an iMac. Using a plugin called Midi Guitar 2 I’m able to capture my simple melodies played on the guitar as MIDI tacks in Garageband. So far so good. I need to score the simply melodies. So I bought Notion 6 to do that. I’m able to manually enter my melody scores into Notion 6. So far so good. But I want a faster way to get from guitar to score in Notion 6. I thought I could export a MIDI file from Garageband into Notion 6, but this is apparently not possible. So is there a way for me to play the guitar and, using Midi Guitar 2, somehow get a music score out of Notion 6? I need both tones and time on the score. Thanks for any insights you might be able to provide! I play lead guitar, rhythm guitar, and electric bass, so this is intriguing. The high-level answer to your question is that you can use MIDI Guitar 2 to send MIDI to NOTION 6 . . . I downloaded and installed the trial version of MIDI Guitar 2 (Jam Origin) and then did some experiments . . . I do everything on the Mac Pro (Early 2008) running Mac OS X 10.11.6 (El Capitan) here in the sound isolation studio, and the install was easy . . . It took me about two hours to make enough sense of everything to have a bit of success, which is encouraging with respect to this actually working with NOTION 6 on the Mac . . . The trial version of MIDI Guitar 2 does not allow saving patches, so I think everything is easier when you have the licensed version, which costs $99 (US), approximately . . . 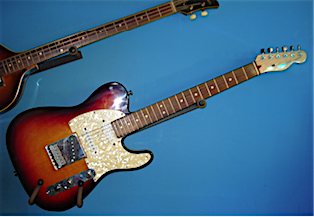 I used my Fender Custom Shop Telecaster for the experiments . . . It took me about an hour to make sense of the basic setup for MIDI Guitar 2, and it took a few more hours to discover how to get it working with NOTION 6 and to create this post . . . The key is that that in the default "TEST PIANO" interface, you need to disable or set a lot of stuff to "None". Additionally, I set it to "MONOPHONIC" . . . In this specific context--using MIDI Guitar 2 and an electric guitar as a MIDI input device--the reason to disable all the special effects and to fine-tune the note tracking is that you want to focus MIDI Guitar 2 on identifying notes, since the goal is to use NOTON 6 and its virtual instruments (native or third-party VSTi virtual instruments) to generate the sounds . . . I used the standalone version of MIDI Guitar 2; and I think this is important and probably required for use with NOTION 6; since you want it to be like an external or virtual MIDI keyboard, which in turn maps to its needing to be standalone rather than running as a VSTi virtual instrument in NOTION 6 . . .
And you need to configure it to output MIDI to a Mac OS X "virtual MIDI cable", which in turn needs to be set in NOTION 6 Preferences as the MIDI Input Port . . .
After discovering most of the requirements for configuring everything correctly, I was able to record MIDI in NOTION 6, which is good . . . However, it was not so precise; hence I think there is more configuration work that needs to be done to fine-tune MIDI Guitar 2 and perhaps the NOTION 6 "MIDI Record" options, as well . . . 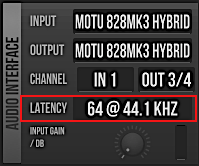 When I set the "Latency" in MIDI Guitar 2 to the lowest value, the results were better . . . The lowest value is "64@44.1 KHZ", which is lower than the value in the first screenshot (see above) . . . There is more to the overall configuring and fine-tuning; and it's important to set the volume level on the guitar and MIDI Guitar 2, as well as the MIDI Guitar 2 noise gate (which I set to the lowest value to make it nearly instantly OFF when the note played on the guitar drops in volume level, where "lowest value" is when the noise gate control is all the way to the left, which makes it a very rapid noise gate). I need to do more experiments to determine the ideal configuration; and there is a bit of merit to getting polyphonic working, if this is possible . . . I have a MIDI monitoring application ("MIDI Monitor" [Snoize]) that lets me watch MIDI messages, and this was how I verified that MIDI Guitar 2 was doing real-time MIDI output before I discovered what needs to be done to get it working with NOTION 6 . . . I ran MIDI Monitor and set it's filters to show only note messages for Channel 1; and there was activity, which verified MIDI Guitar 2 was doing MIDI output, which was an important clue in determining why NOTION 6 was not receiving any MIDI from MIDI Guitar 2 . . . The reason was that I had not configured MIDI Guitar 2 to send MIDI output via IAC Bus 1 . . .
Once I got that part of the MIDI Guitar 2 interface properly configured, NOTION 6 received MIDI from MIDI Guitar 2; and now it's mostly a matter of fine-tuning MIDI Guitar 2, the electric guitar itself, and NOTION 6 for the best and most distinct MIDI, which will require more experimenting here in the sound isolation studio . . .
MIDI Guitar 2 works with NOTION 6, but everything needs to be configured correctly . . . When the rules make more sense, I will post some follow-up information; but based on a few hours of experimenting, I can state that MIDI Guitar 2 works with NOTION 6 in a general way . . . I think that once I discover how to fine-tune the note tracking and converting to MIDI, it will work better . . .
P. S. I did a bit of price checking on new Telecasters and was a bit surprised that the prices appear to be significantly lower today than they were 20 years ago . . . The only logical explanation is that they are made robotically now and have very little handcrafting, other than the Fender Custom Shop "Masterbuilt" models, which are considerably more expensive now . . .
At least it's still possible to get an excellent Telecaster, which is fabulous . . .
On a related note, I am pondering the idea of adding GraphTech Ghost® Hexpander MIDI and Acoustic-Phonic technology to The Fabulous Fifty Million Dollar Stratocaster, since among other thing this maps to highly-precise MIDI and is a relatively easy mod, except that it requires even more wood routing to make space for the additional circuit boards, controls, and wires . . . There is not so much available space on the body of the Stratocaster, and the only two possibilities are somewhere in the upper region (above the low-pitch "E" string) where nothing is structurally significant . . . 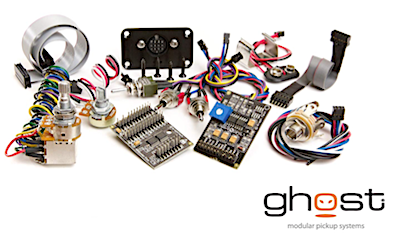 The more logical strategy is to mod the Telecaster since it has a larger body, hence plenty of room to add a compartment for the GraphTech Ghost® technology components, wires, and cables . . .
Modding the Telecaster has the additional advantage that travels with not having a whammy bar, which for MIDI makes everything simpler and ensures the note tracking is at the highest precision . . . The primary differences in getting MIDI output this way as compared to MIDI Guitar 2 are (a) that it is highly precise and (b) that it does not require running a separate Mac OS X MIDI conversion application; but it costs more (approximately $450 [US]) for the complete Ghost® kit and saddle pickups; and in this instance it requires physically modifying the guitar body, which is fine with me . . . 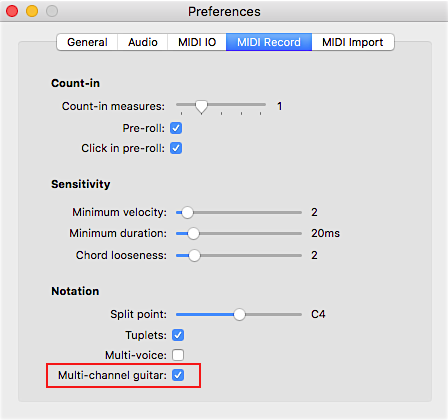 NOTION 6 has the ability to separate MIDI guitar input by string when the MIDI controller (real like the Ghost® system or virtual like MIDI Guitar 2) provides this information, in which case the "Multi-channel guitar" option is selected in NOTION Preferences on the "MIDI Record" tab . . . I very much appreciate you're time and effort to help me. Clearly I have much to learn. I didn't get very far... I'm running a 2014 iMac with MacOS Mojave. I have the purchased version of MG 2 (v 2.2.1) so I am able to save patches, etc. I started with the Test Piano patch and saved my modifications as Ted’s Patch 1. 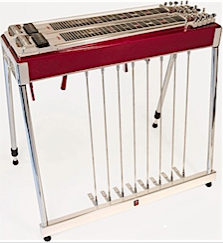 I tried to set up Midi Guitar 2 as you describe below, but immediately ran into trouble. I tried to set the MG 2 interface input and output to MOTU 828mk3 Hybrid but the only options I have are Built-in Microphone and Scarlett 2i2 USB and Built-in Output and Scarlett 2i2 USB. Also, my version of MacOS looks very different for Audio Midi Setup. 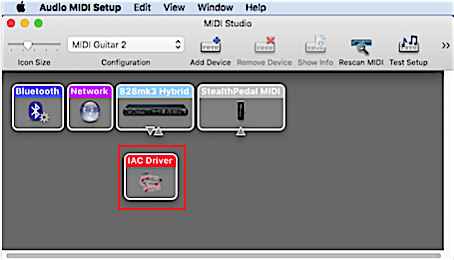 And I could not find any way to to create the IAC driver device, or to select MIDI Guitar 2 in the dialog box. In the dialog box when I click + to add a device my choices are Create Aggregate Device, Create Multi-output device and Connect Airplay device. Nothing I can see resembles the Audio Midi Setup dialog box in your screen shot. I don’t have a MIDI monitor utility. But when my Acoustic guitar pickup is connected to the Scarlett 2i2 box on input 2 I can see some motion in the MG 2 interface--so I think the basic connection is working between guitar and MG 2. I attached a screen shot of the MG 2 settings. I plan to try various settings using the stuff in your post where I’m able to. I’ll let you know if I have any breakthroughs. Any additional thoughts or suggestions you might have would be much appreciated. tedhorsch wrote I have an acoustic guitar connected to a Focusrite 2i2 ...Using a plugin called Midi Guitar 2 I’m able to capture my simple melodies played on the guitar as MIDI tacks in Garageband. So far so good. Using the stand alone version shown below as mentioned Surf.Whammy, select your audio interface - the Focusrite 2i2 - in the upper left. 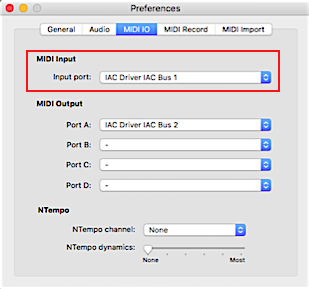 Leave the MIDI Interface Output set to Virtual MIDI Output. No need for the IAC bus in this situation. Adjusting the Noise Gate strikes a balance between filtering out false triggers vs latency. Adjust this when using the Test Piano but no other MIDI FX. In Notion Preferences>Audio, select your Focusrite 2i2 interface. In Notion, enter Step Input record, select note values, play the notes on your guitar. This is helpful! I am able now to get notation into Notion while playing my guitar. Problem is that the score barely resembles what I'm playing. I am testing with a very simple set of notes on the guitar--a simple melody with no chords. But Notion is recording notes when I am not playing them and also showing harmony score when I'm playing only single notes. I'm experimenting with the gain settings, but they don't seem to make much difference. Also, for some reason that I can't figure out I can't get notion to play back sounds I can hear. I doing the play command in Notion and I can see the recording head moving across the score, but nothing is coming out of my computer speakers. Also tried to use my Scarlett 2i2 monitor headphones, but no sound comes out of them when I'm playing back a score. 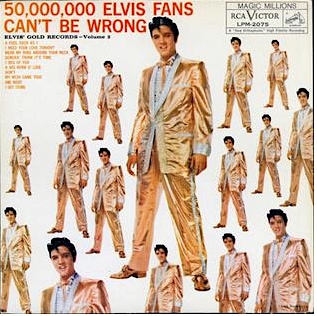 I've checked the configurations for the speakers and it looks like everything's fine. But no sound! Thanks so much for responding and helping! I have a Fishman Triple Play MIDI setup on a guitar. Fast response and originally came bundled with Studio One and Notion. It was demoed at one of the PreSonuspheres By Burr Johnson. Amazing piece can split fretboard with different patches as well as individual strings. Problem is that the score barely resembles what I'm playing. I am testing with a very simple set of notes on the guitar--a simple melody with no chords. But Notion is recording notes when I am not playing them and also showing harmony score when I'm playing only single notes. Can you post a screen grab of the notes in Notion? That would make it easier to interpret what's going on. One thought is that the acoustic guitar body is a very resonant chamber. Conversion of guitar notes to MIDI data works best with clean pitched transients as with electric guitars with the bridge pickup active.. Playing with accurate technique and muting strings not intended to sound may produce cleaner notation. 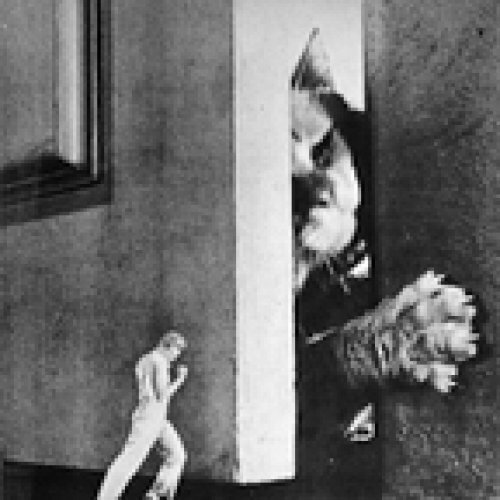 tedhorsch wrote Also, for some reason that I can't figure out I can't get notion to play back sounds I can hear. I doing the play command in Notion and I can see the recording head moving across the score, but nothing is coming out of my computer speakers. Is sound produced when clicking on the onscreen keyboard or fretboard? Are the mixer faders up or at zero? Skip Jones wrote I have a Fishman Triple Play MIDI setup on a guitar. Fast response and originally came bundled with Studio One and Notion. It was demoed at one of the PreSonuspheres By Burr Johnson. Amazing piece can split fretboard with different patches as well as individual strings. I've seen videos of Burr Johnson demonstrating the Fishman Triple Play. His fast and fluid playing ability really showcase the incredible tracking performance of the FTP pickup. The FTP software does provide amazing capabilities, I would imagine especially for live performance. I have kept in touch with him, still got his number. Quite a skilled guitarist! "Not your father's MIDI" indeed! 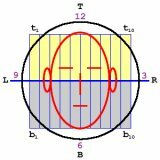 CSeye wrote Is sound produced when clicking on the onscreen keyboard or fretboard? No sound when clicking the onscreen fretboard. I know that at one point I was getting sounds, so I've somehow messed up a setting somewhere. I checked the mixer and tried the fader at 0, at +10 and at -10 and go no sound on any of the settings. I hadn't used the mixer before. Your thought about the acoustic guitar makes sense. I've experimented a little with trying to mute strings while playing and there seems to be a difference in the resultant score, but either way it looks kind of goofy. I may just need to practice a bit? Are you entering notes with Step Entry or realtime MIDI recording? Step Entry (⌘+E) will produce the cleanest notation when using MIDI guitar as the controller. Select the note values from the palette or keyboard shortcut. W=whole note, H=half note, Q=quarter note, E=eighth, etc., then play the notes one at a time on your guitar. No need to rush as Notion waits for you to play each note. The keyboard shortcuts function as a toggle for note or rest of the same value. Alternately, hit the space bar to create a rest for the currently selected note value. CSeye wrote Are you entering notes with Step Entry or realtime MIDI recording? I've tried both. As far as I can tell the Step Entry feature does seem to capture the notes more cleanly, but it only capture tonality--no time. For me, the hardest part of doing notation is the note timing. If everything was quarter and eighth notes I'd be find doing notation manually. Problem is that the melodies I'm trying to score have a lot of different time values and I was hoping I could capture those while playing rather than figuring them out manually. Do I understand correctly that Step Entry will only capture the tones or am I missing something? Likewise, am I correct that realtime MIDI recording (theoretically) captures both tone and time? tedhorsch wrote I tried to set the MG 2 interface input and output to MOTU 828mk3 Hybrid but the only options I have are Built-in Microphone and Scarlett 2i2 USB and Built-in Output and Scarlett 2i2 USB. As other forum members have explained, everything is specific to your Mac, external digital audio and MIDI interface, guitar, and so forth. What works for me probably will be different unless you have the same computer, operating system, and various hardware, including the same type of guitar . . . 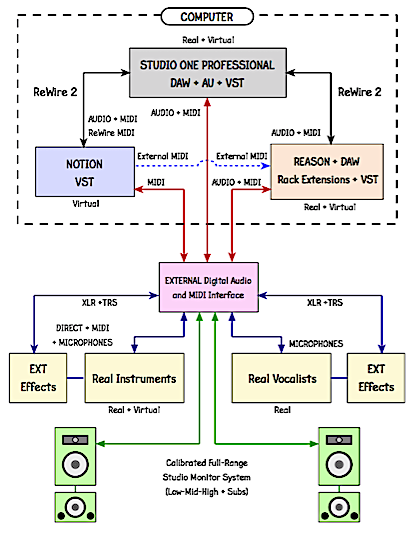 This diagram of what I consider to be the Complete Digital Music Production System might be helpful in understanding everything . . . In your system, you are using a Scarlett 2i2 USB external digital audio interface (no MIDI), so this is what you need to specify instead of the MOTU 828mk3 Hybrid that I use here in the sound isolation studio . . .
At the time I replied, I had not investigated the MIDI Guitar 2 "Virtual MIDI Cable" option; but since it's there, you can use it instead of a IAC Driver virtual MIDI cable, which is nice . . . There are virtual festivals of options for nearly everything in the digital music production universe, and as a general rule when something is not working, it's nearly always a matter of one or more options not being configured correctly--not always, but most of the time for sure . . . I think it's accurate to state that the best note tracking for conversion to MIDI will occur when you use MIDI hardware (transducer or pickup, MIDI conversion hardware, and so forth) . . .
MIDI Guitar 2 can work, but it's going to depend on how you fine-tune the various interface parameters . . . So far, my results tend to match your results; and while MIDI Guitar 2 is identifying notes and converting them to MIDI, it's not so precise; and I am doing this with an electric guitar, which should make it easier to identify notes . . . 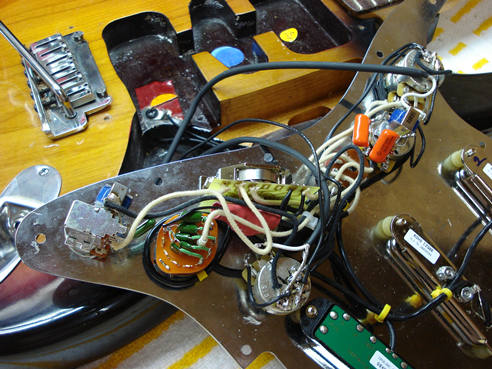 I am fine with doing guitar body routing on the Telecaster to make room for the Ghost® system components; and it's something I know how to do . 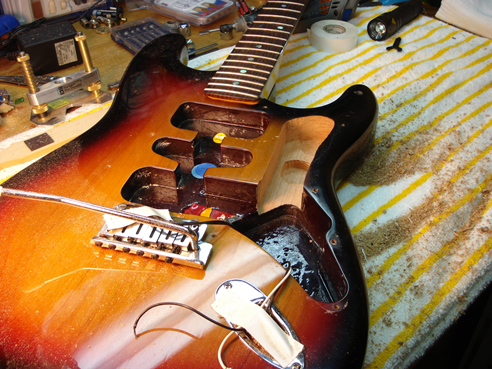 . .
Due to the shape of the Telecaster guitar body, there is plenty of available non-structural space; and I can do the routing from the back of the guitar body, so it will not be visible from the front (other than adding a few more controls to the pickguard, which also is easy to do in non-structural areas . . . There are other MIDI hardware systems that are designed for acoustic guitars and do not require elaborate mods, but all these devices require a decoder in addition to the MIDI pickup, which as best as I can determine is the case with the Ghost system . 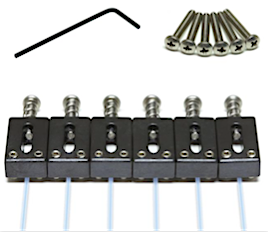 . .
More specifically, this is focused on 13-pin MIDI "pickup" systems like the GraphTech Ghost® system, where the key bit of information is that the 13-pin output actually is the audio for each of the six strings, with the audio for each string on a separate wire or pair of wires . . . The Ghost® system does not output MIDI, so getting the audio converted to MIDI requires a MIDI converter like the Roland GK-55 Guitar Synthesizer (approximately $700 [US]) . . . It's not so easy to find all this information, but after a bit of sleuthing I found the key bit of information, which is that the Ghost® Hexpander system outputs audio separated and identified by string; and it does this using a 13-pin connector . . . The audio for each string is detected by the required Ghost® saddle pickups . . . In other words, to get standard 5-pin MIDI, you need the Ghost® Hexpander, Ghost® saddle pickups, and a MIDI converter like the Roland GR-55 Guitar Synthesizer, which when you add the Ghost® Acoustic-Sonic components and assorted controls, switches, and so forth costs about $1,200 (US) and as best as I can determine maps to highly precise MIDI from an electric guitar . . .
Then you need to discover how to use all this stuff . . .
On a related note, Roland owns BOSS, and there is a BOSS guitar synthesizer, but it does not have standard MIDI In/Out; so it will not work in this specific scenario where the goal is to get standard MIDI output to connect to an external digital audio and MIDI interface which then feeds MIDI to NOTION and Studio One. It has the required 13-pin input connector, but it does not do the MIDI conversion to standard 5-pin MIDI In/Out . . . However, it supports MIDI via USB; so this is another option if you do not need standard MIDI cabling and MIDI compliance in this respect; and it has the required 13-pin input connector . . . This is not an inexpensive endeavor, which is the primary reason I have not done it, although I continue to ponder the idea of doing it . 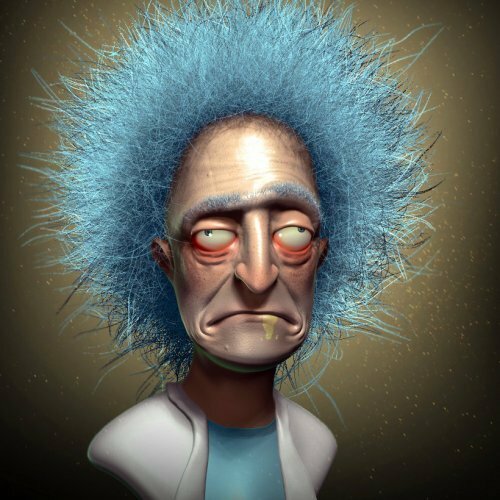 . .
Last edited by Surf.Whammy on Tue Jan 15, 2019 4:37 pm, edited 1 time in total. Thanks everyone for the inputs and help. To close this issue out from my perspective: I'm concluding that while Midi Guitar 2 in theory is a great idea, in the real world working with MD2 and an acoustic guitar you can't create a viable score in Notion 6. Viable here defined as capturing notes--including both pitch and time values--accurately. Or even close to accurately. That's too bad, but I learned a little more about digital music and MG 2 only cost $100 or so. No great loss. Thanks again for helping educate me! I'm not sure what I'm going to try next (I still need to score my simple guitar melodies somehow), so I'll probably be back! I did a bit more research, and the Fishman TriplePlay Wireless MIDI Guitar Controller looks intriguing . . . There are two related products, and it begins with the the TriplePlay Wireless MIDI Guitar Controller, which has (a) a pickup that gets the information from the guitar strings, (b) a guitar MIDI controller, and (c) wireless hardware (antenna and USB Receiver) . . . 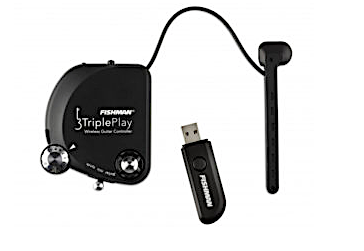 The USB Receiver is attached to the computer (Mac or Windows) and receives the MIDI signals sent from the TriplePlay Wireless MIDI Guitar Controller. In this configuration, everything necessary to convert the guitar string vibrations to MIDI and then to send MIDI to a Mac or Windows computer wirelessly is provided . . . The second product is a standalone unit that replaces the USB MIDI functionality of a Mac or Windows computer with a hardware unit which converts the MIDI to standard 5-pin MIDI and provides additional functionality . . . If you have an external digital audio and MIDI interface that has a standard 5-pin MIDI Input port, then you can use the standard 5-pin MIDI Output of the Fishman TriplePlay FC-1 Controller foot pedal unit to get MIDI to your computer, which creates additional capabilities . . . The TriplePlay Wireless MIDI Guitar Controller looks to be the lowest cost, complete unit because it does not require a 13-pin analog-to-MIDI converter . . . Instead, the TriplePlay Wireless MIDI Guitar Controller has everything necessary to convert the guitar string vibrations to MIDI and to send the MIDI to a Mac or Windows computer wirelessly, where it is received by the included USB Receiver; so it's a complete end-to-end package . . .
Amazon sells it for $400 (US), and it comes with a lot of useful software (earlier versions but they probably qualify for discounted updates for some of the associated products, which in itself has value) . . .
Musician's Friend has the TriplePlay FC-1 Controller foot pedal for $175 (US), which is better than the Amazon price ($200 [US]) . . . The TriplePlay FC-1 Controller foot pedal has standalone functionality, but from my perspective the important aspect is that it provides standard 5-pin MIDI connectivity, which among other things maps to the USB Receiver MIDI aspect being handled by the TriplePlay FC-1 Controller rather than by the computer, since when you use it with a computer, you actually are sending standard 5-pin MIDI to an external digital audio and MIDI interface, all of which maps to a good bit of the work being done externally to the computer, hence the computer has more available system resources for what the computer needs to do in the digital music production universe, which specifically is running the Digital Audio Workstation (DAW) application, NOTION, Reason (Propellerhead Software), ReWire, and the various AUi (Mac-only) and VSTi virtual instruments (Mac and Windows), as well as AU (Mac-only) and VST (Mac and WIndows) effects plug-ins, and so forth and so on . . . Focusing the computer on what it must do is very important, even when the computer is state-of-the-art and very fast . . .
"[The Fishman TriplePlay Wireless Guitar Controller] includes full versions of: Native Instruments – KOMPLETE Elements and GuitarRig LE, Notion Music - PROGRESSION 2, IK Multimedia - SampleTank 2 XT and AmpliTube Custom Shop, and PreSonus - Studio One Artist TriplePlay Edition." All these software applications are older versions, so they probably are 32-bits rather than 64-bits, but the key information in this context is that the Fishman TriplePlay Wireless Guitar Controller outputs MIDI, hence will work with current versions of software applications that are 64-bits . . . This works with electric guitars and acoustic guitars, and it does not require extensive modifications to the guitar . . .
P. S. I like the GraphTech Ghost® system in part because I like to do guitar mods, but it costs approximately $1,200 (US) when you add the required MIDI controller . . . 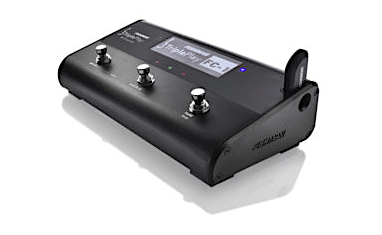 The Fishman TriplePlay Wireless Guitar Controller costs less ($400 [US]) and with the TriplePlay FC-1 Controller foot pedal ($200 [US]) brings the total to half the cost of the Ghost® system and required MIDI controller to get the same functionality, including standard 5-pin MIDI connectivity . . . It also has the advantage of being wireless, hence does not require an expensive 13-pin cable . 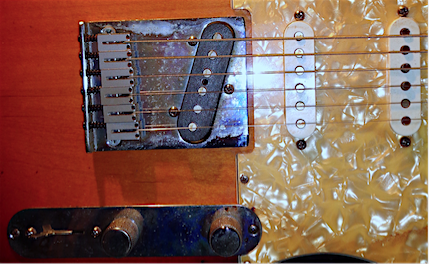 . .
At present, I can't afford either strategy; but I like the idea of starting with the Fishman system on the already modded Fender American Deluxe Stratocaster and then later modding the Telecaster for the Ghost® system, which is fabulous . . .
- Min velocity which filters outs quiet notes. - Min duration which filters out short notes. These settings above were used to record the short piece below in real time with an electric guitar and the MIDI Gutiar app. Nothing spectacular but nothing edited either. Here's some interesting data that suggests the newer Roland GR55 MIDI guitar converter has more delay compared to older converters when triggering external instruments. Surf.Whammy wrote I like the idea of starting with the Fishman system on the already modded Fender American Deluxe Stratocaster and then later modding the Telecaster for the Ghost® system, which is fabulous . . .
A few years ago, I obtained the gorgeous blue brushed metal GR55. The COSM guitars, amps, and fx were mighty impressive. Roland stated that triggering the internal sounds was faster than older converters, which seemed to be the case. The issue was the noticeable delay when playing either hardware sound modules of virtual instruments. I returned the unit and over time replaced it with a JTV-59 variax on which I placed the Fishman Triple Play which worked great! 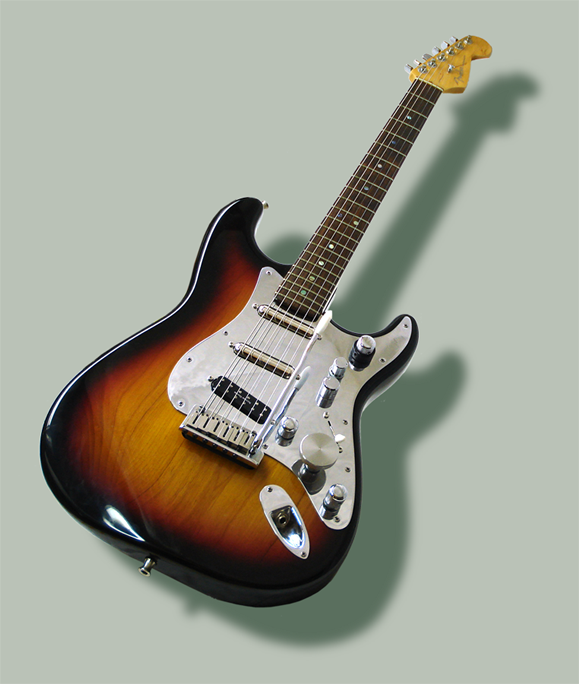 The FTP is simply the fastest and most accurate MIDI guitar converted available. Thanks for posting this. I went back and did some testing with the various settings and got better results with higher setting for min velocity and duration. Still not ideal, but at least I now can get a score that closely resembles what I played through MIDI Guitar 2. In fact, some of the note time durations are very accurate--even usable! I looked briefly at websites for the Roland MIDI guitar converter hardware. Looks impressive, but a bit too expensive for my budget at present. I also decided to splurge for Logic Pro X and one of the next things I'll try is to record guitar tracks as MIDI and then import the file into Notion 6. I also think an electric guitar may make the whole MIDI thing work better, so I'm thinking about maybe getting a not-too-expensive electric guitar that I can use for getting played sounds translated into scores. I have some other reasons for wanting an electric guitar so it's a little easier to justify the expense.